Wetherspoons plans to open a hotel and rooftop bar above its Bright Helm pub in West Street, Brighton. 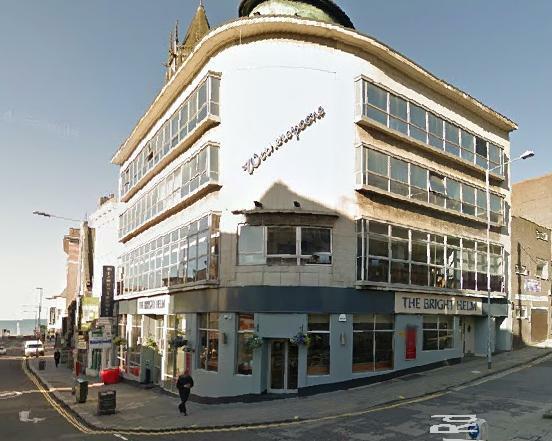 The pub company has applied for permission to convert the second and third floors of the building from flats into 14 hotel rooms. And it also wants to create another bar on the roof, complete with hoists to deliver food from the kitchen, and a permanent smoking shelter. It adds: “A continuing difficulty with these premises in that they do not have any beer garden area, resulting in smoking customers congregating around the main ground floor entrance. Wetherspoons operates more than 30 hotels at locations across the country but this would be the first one to open in Sussex. As you’d expect from the no-nonsense chain, prices are priced at the lower end of the market, starting at £39 a night. It says only one of the existing flats above the West Street pub is currently occupied.